Maker adding 1,000 jobs in battery car development. 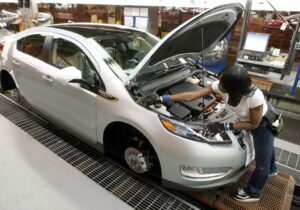 The 2011 Chevrolet Volt officially goes into production. Even as it confirms plans to add another 1,000 jobs to boost its battery car program, General Motors said it is contemplating whether to expand production of the new Chevrolet Volt. 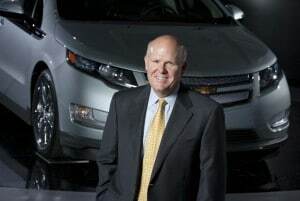 GM CEO Dan Akerson, while stopping short of saying the Volt will be a runaway hit, says he has asked for a study of whether it’s feasible to ramp up production of a vehicle that was supposed to undergo a slow and cautious roll-out reflecting both uncertain demand and the challenge of producing an entirely new type of powertrain technology. News Now! Click For A Free Subscription! The so-called “Poletown” assembly plant is currently operating on only one shift so GM has at least the plant capacity to bump up Volt production. Battery-pack production could be a potential bottleneck, however, if demand for the Volt takes off. No hard date for selling off remaining government shares. GM's IPO was "successful beyond expectations," said CEO Dan Akerson. General Motors considers the initial public offering of its new stock a great success after raising an all-time record $23.7 billion for its principal shareholders and the company itself, said CEO Dan Akerson during his first public appearance since the IPO was completed. However, GM’s board of directors won’t have a voice in the timing of the sale of the next block of GM stock Akerson cautioned. “The IPO was successful beyond expectations. We’re very proud of that,” Akerson said. “I don’t know when the next road show will be,” Akerson said after the ceremony marking the “official” start of production for the Chevrolet Volt, at the company’s Detroit-Hamtramck assembly plant. “The board is responsible for the management of the business. The government has stayed out of the management of the business,” Akerson said. “That’s the preserve of the board,” he said. But GM’s principal shareholders, notably including the U.S. Treasury Department, will determine whether additional GM share are put up for sale. “They’re like any other shareholder. They are going to determine the next step,” Akerson said. Is that steam? The Toyota Prius faces another snag. The big number recalls continue at Toyota, more than a year after the maker announced the first safety campaign caused by runaway vehicles. The latest action involves 650,000 of Toyota’s third-generation Prius hybrid due to a defective coolant pump that can cause the vehicles to overheat and lose power. 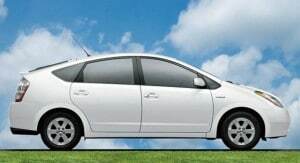 Nearly 60% of the Prius hybrids involved in what is officially a service action were sold in the United States, according to Toyota, which says it will cover the cost of any repairs conducted at one of its dealerships. The maker says the problem involves an electric water pump that can slowly permit air bubbles to enter the coolant lines. As that happens water circulation slows and temperatures rise, resulting in overheating of the hybrid-electric componentry. Initially, that should trigger a warning light, but if the problem is left unattended, the vehicle would drop into a “fail-safe” mode where power would be reduced. It is not clear from Toyota’s statement whether permanent damage to the vehicle might result if the problem were still ignored. Ford recycling old clothing for use in new Focus model. 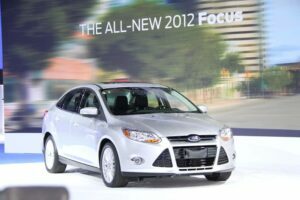 The 2012 Ford Focus will make use of recycled jeans and other materials. While some folks routinely give old clothes to charity, those worn jeans and torn sweaters are far more likely to end up in the landfill. But Ford Motor Co. has found yet another, better use for those old bell bottoms. With the debut of the 2012 Focus, cotton from recycled clothing will be transformed into carpet backing and sound-deadening insulation. Each car will use the equivalent of about two pairs of classic American jeans, the company says. News, Reviews and More! Click Here! The use of recycled and non-traditional materials dates back to the days of Henry Ford himself, a strong advocate for the use of soy-based materials – some of which came from the soybean crops grown on his vast land holdings near Ford Motor Co.’s Dearborn, Michigan headquarters. The maker continues to use soy foams for seating, along with recycled plastics and even re-purposed rubber from tires, for applications ranging from interior panels to pedal covers. Luxury maker betting it can get into the swing of things. Buick is out, but Caddy's in as a title PGA sponsor. Cadillac will make its return as a high-profile sponsor of professional golf, next year, and aims to bring a PGA tournament event back to Detroit, the maker announced. The move underscores a broader strategy by General Motors to resume its long-time role as a major sponsor of high-visibility sporting events, something GM had to pare down and eventually abandon in the years leading up to last year’s bankruptcy. Caddy will become the title sponsor of the Cadillac Championship, which will be played at the TPC Blue Monster, the challenging Doral Golf Resort & Spa in Doral, Florida. Caddy also will become an umbrella sponsor of the World Golf Championships. Assistance saved nearly $100 million in personal income. Government assistance to General Motors and Chrysler enabled orderly bankruptcy proceedings and led to the saving of more than 1.14 million jobs in 2009 alone, according to a recently released study by an automotive think tank. The study, by the Ann Arbor-based Center for Automotive Research, estimated that an additional 314,400 jobs was saved in 2010. The government help save $96.5 billion in potential personal income losses and allowed $28.6 billion in social security and personal income taxes to be paid to the federal government. At the time of the bailout, some pundits, and even some lawmakers, suggested that Chrysler and GM didn’t deserve the government’s help. Some even suggested that the bailout was a waste of government money. Key victory for new Nissan battery-electric vehicle. The 2011 Nissan Leaf wins a key award. 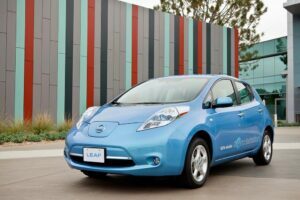 After watching its top battery car competitor, the Chevrolet Volt, snag several key endorsements, the 2011 Nissan Leaf has landed a big one of its own. The compact battery-electric vehicle, or BEV, has been named European Car of the Year, overcoming tough competition from an assortment of conventional and “green” products. Leaf’s victory not only marks the first time a battery car has won the influential award but the first time an electric vehicle has simply made it into the final round, where Nissan’s entry was pitted against the Alfa Romeo Giulietta, Opel Meriva, Citroen C3/DS3, Dacia Duster, Ford C-Max and Volvo S60. Strong initial demand could herald a return to the glory days. Early orders suggest the 2011 Ford Explorer will come out of the blocks strong when it goes on sale early next year. It spent years at the top of the SUV sales charts before crashing, ignominiously, in the wake of a safety scare. But even before the completely redesigned 2011 Ford Explorer actually rolls into showrooms it’s showing strong signs of success. With the new crossover-based version of the Explorer not set to roll into showrooms until early next year, Ford dealers have already booked 15,000 advance orders, twice what the maker was anticipating. And buyers appear to be opting for heavily loaded versions of the SUV, which could make the next-generation Explorer a significant source of profits for the resurgent Ford. If the initial pace of orders holds steady it will serve as justification for the automaker’s risky decision to shift from a traditional, truck-based sport-utility vehicle to a car-like crossover. Ford has been considering that strategy for some time but ultimately chose to stick with a body-on-frame design for the last Explorer. It might not have made much of a difference in the wake of an unexpected crisis triggered by reports that earlier Explorers were suffering unexpected and catastrophic tire blow-outs that could cause the vehicles to roll over. 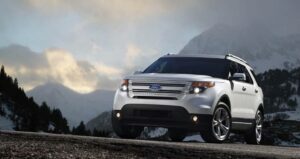 While sales initially held steady, demand for the Explorer eventually began to tank, and by 2009 volumes had plunged nearly 80%. Paefgen retiring, Durheimer to lead luxury maker as it struggles to regain momentum. In with the new car, out with the old CEO. Franz-Josef Paefgen poses with the second-generation Bentley Continental GT. In the midst of a major new product roll-out, Bentley is about to undergo a major shake-up in its management team, as well. Long-time CEO Franz-Josef Paefgen will retire, with Wolfgang Durheimer slotted in as his replacement next February. The executive shift comes as Bentley is in the midst of re-doing its entire line-up. The British marque’s aging flagship sedan, the Arnage, was recently replaced by an all-new model, the $285,000 Mulsanne. Next up is an all-new version of the Continental line-up, Bentley’s volume mainstay. The sporty Continental GT replacement made its debut, last month, at the Paris Motor Show. The original Continental was a transformative model for Bentley, which was purchased by Volkswagen AG a little more than a decade ago. Launched during Paefgen’s 8-year tenure as CEO, it generated sales numbers never before seen in the ultra-premium luxury market. Immediately prior to the 2008 global economic meltdown, Bentley sales soared to more than 10,000 a year, with the various Continental spin-offs, including the GT coupe, Flying Spur sedan and GTC convertible accounting for 90% of that volume. Why our intrepid columnist has begun a love affair with Ford’s Transit Connect. 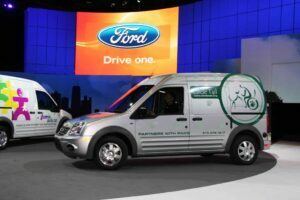 Flexibility was a major reason for the Ford Transit Connect's 2010 North American Truck of the Year win. First, there’s the name. Two words with individual meanings that seem rather specific. “Transit:” getting from one place to another. And “connect:” hooking up, joining. But together they seem like one of those oddly printed word pairs you run across on the internet — decipher and type it correctly in a box and you gain the access you seek. A sly metaphor maybe? Then there’s the look of Ford’s Transit Connect. High in the brow. Purposeful. Busy. Replete with elfin usefulness. Over-achieving (seeming to say “I may be small but look what I can do!”). I like that in a vehicle. And versatility. It’s a chunk of balsa wood – make what you want of it. Versatility, changeability. Those are the appealing traits of another vehicle I am drawn to, ex-Dodge now Mercedes — or Freightliner – the Sprinter. Similar character, different sizes.